Celtic's Ronny Deila is the SPFL Premiership manager of the month for November. The champions won all three of their league matches last month, moving to the top of the table for the first time this season. "Football is about team-work," said Deila. "I am the leader but this proves we are working well together. "We have worked really hard to get the right results and this is a sign that we have done something right." Deila, 39, succeeded Neil Lennon in the summer and was manager of year in his native Norway in 2013 after winning the title with Stromsgodset. Celtic drew with Astra and lost to Salzburg in the Europa League in November, with progress to the last 32 assured with a game to spare. 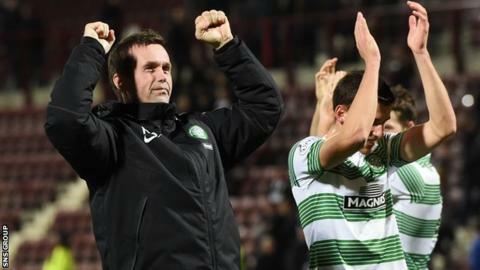 In a busy month, Deila's team also beat Hearts 4-0 to reach the fifth round of the Scottish Cup. Celtic have carried their good form into December with league victories over Partick Thistle and Motherwell.